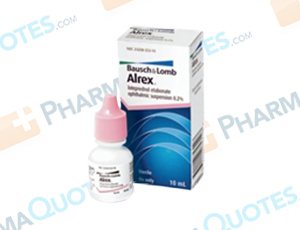 Alrex is an ophthalmic (eye) corticosteroid medication used to treat and temporarily relieve signs and symptoms of seasonal allergic conjunctivitis. It works by reducing inflammation in the eye. This medication is for ophthalmic use only and should be used temporarily. To use this product beyond 14 days of treatment, you should undergo a thorough examination from your doctor. Corticosteroids can result in glaucoma, damage to the optic nerve, and visual defects when used for prolonged treatment. Remove contact lenses before administering eye drops. Do not contaminate the sterile dropper during administration. Wash hands thoroughly before administering this medication. Wait 10 minutes before applying other eye medications. Expect redness and itching when administered. If these effects worsen or persist, contact your physician. It’s important to follow manufacturer, pharmacy, and doctor’s instructions when using this and other medical products. General Alrex Warning: The above information is for informational purposes only and is not meant to be a substitute for professional medical advice, diagnosis or treatment. Please seek professional medical advice before starting, changing or terminating any medical treatment. Pharmaquotes is not offering medical advice, pharmaceutical recommendations or endorsing any specific prescription drug, pharmacy or other information on the site. Pharmaquotes provides no warranty or guarantee for any of the discount data, medication, or other information.